Summer is always billed as a slow, relaxing season. Anyone who stays home with little kids all day knows otherwise. A mom's summer days are filled with entertaining bored kids, finding lost flip flops, chauffeuring littles ones to VBS, parks, pools, and playdates; and generally trying to hold onto her sanity. That's why I like to rely on simple, tried-and-true recipes for those days that I'm just too worn out to cook something from scratch for the 15th neighborhood barbecue of the week. 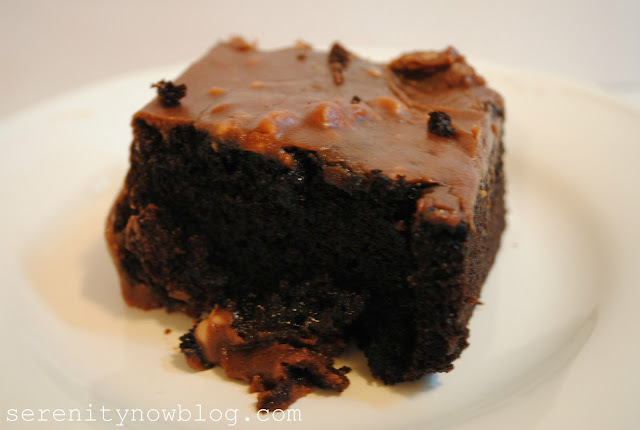 My recipe for Chocolate Picnic Cake fits the bill...it's one of the easiest recipes I've tried and it satisfies the chocaholic chocolate lover in me. 1. Grease and flour a 13 x 9 baking pan. Beat the first 4 ingredients (and the cinnamon, if desired) at low speed with an electric mixer 40 to 45 seconds or until combined. Beat at medium speed 2 minutes or until smooth, stopping to scrape down the sides. 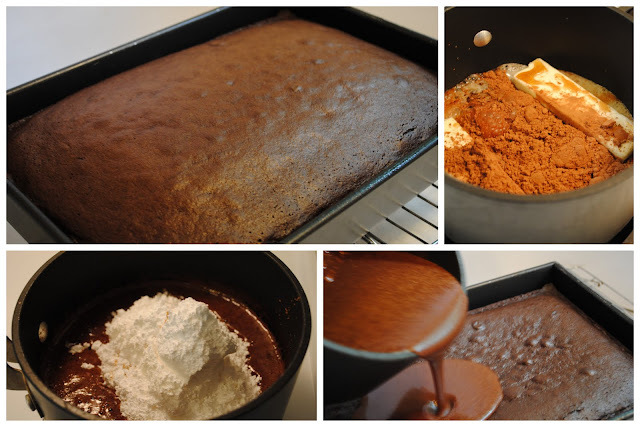 Pour batter into prepared baking pan. 2. Bake at 350 degrees F for 30 minutes (35 if you use a glass baking dish), or until a wooden toothpick inserted in the center comes out clean. Cool 10 minutes. Spread Cola frosting over warm cake. Bring first 3 ingredients to a boil in a saucepan over medium heat, stirring until butter melts. Remove from heat. Stir in sugar and vanilla until smooth. Note: I got distracted by the rumble over the Barbies in the other room and accidentally used two sticks of butter, as you can see from the photos. I was able to fix my mistake by toying with the recipe, but don't follow in my footsteps. My icing isn't as smooth as can be (you can see that the powdered sugar didn't dissolve all the way), but when you have two small helpers in the kitchen, perfection isn't always an option! This is an all-around picnic crowd pleaser, even if it contains a few unconventional ingredients! My husband, whose picky eating habits are famous, devoured a piece or three after getting over the idea of adding mayo to a cake mix. Linking to Centsational Girl for the BBQ and Picnic Ideas party. Join me tomorrow for Session #1 in my new Blogging Myths series for bloggers! Yum! I've never made this myself but I think I've had it many times at pot-luck dinners. It looks so good and I think it's about time I made it for myself! It looks delicious! I think I'll try it out this year. Oh yum...think I'll actually make this tonight :) thanks for sharing! amanda-why do you always tease me with these yummy, yummy desserts when i'm having my morning coffee :) i've seen this recipe before but never made it-i'll have to try it with my 10 year old soon-she loves to bake and try new recipes! I've never had this kind of cake, but I love recipes with unconventional ingredients... they're really good for conversation! 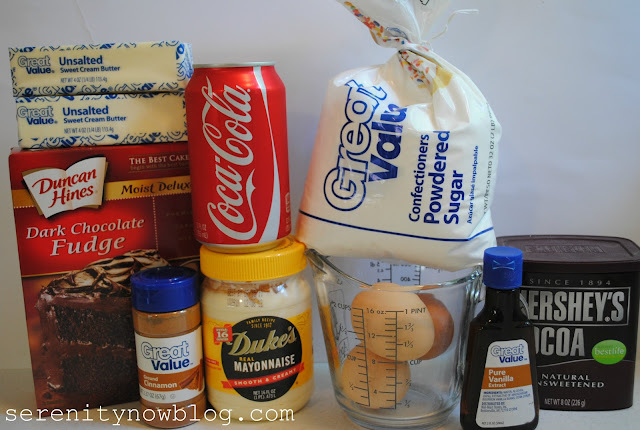 I love the sound of cola frosting- I'm going to make this cake for sure! There really is nothing better than chocolate cake :) And this one looks reaaalllly good. I guess the mayo substitutes for oil? This looks delicious, especially with the cola. 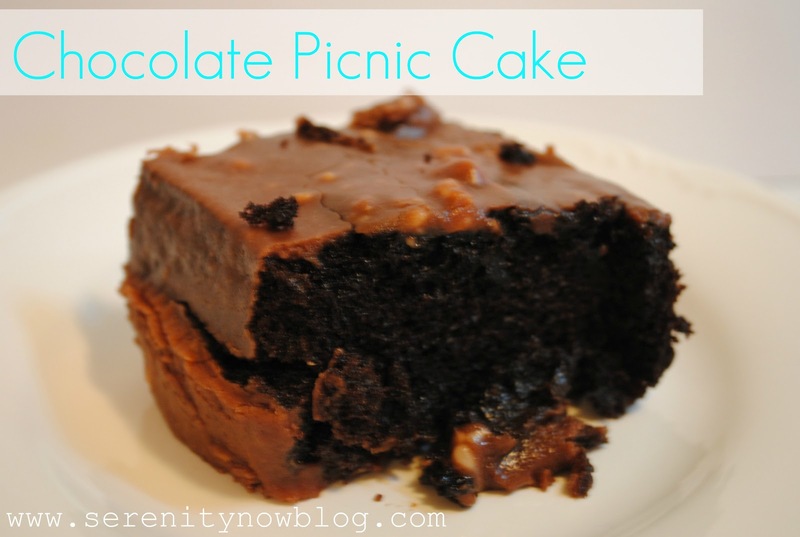 When I saw your title, with "picnic" and "chocolate cake" in the same sentence, it sparked a memory. When I was in college, my friends and I decided to have a picnic at the park. Of course I volunteered to bring the cake. I set it down while we had lunch, and when we came back to it, there were about a million ants in it. I still shudder at the image. Aacck!! That looks amazing!! I am ready to dive head first into one of those!! Oh, my. That looks so good! Thanks for sharing the recipe. Oh YUM!!!! 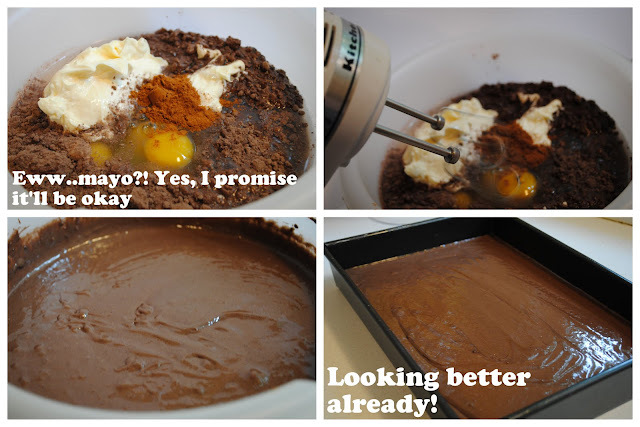 I love chocolate cake and I've never tried one made with mayo! I'm not skeptical- I'm sure it's delish and nice and rich! Oh. My. Gosh. This looks sinfully divine. I think I gained five pounds just drooling over the photo on my computer screen! Ha. Thanks for sharing the recipe Amanda. I want that RIGHT now! Looks so yummy. Thanks for sharing. I'm coming over...is there any left? Hey, mayo is basically eggs and oil, so it makes sense in a cake! Oh my...that looks so sinful. It is a good thing we don't keep chocolate in our house (due to daughter's migraines)...I'd eat the whole thing in one sitting!! Yummo! I will have to try this! WOW! I am literally DROOLING!!!! That looks like HEAVEN!!!! yummy!!!! Oh my gosh. Can you make this for the next gno? lol. I am going to try this. Thanks for the recipe. Oh my word. YUM. Just woke up and you have me wanting to eat a whole pan of this!! wishing my Dr had not put me on a strict diet right now. My mouth is watering over how yummy this recipe looks. Yum, that cake sure looks delicious!! I'm wondering if this is similar to the Chocolate Mayonnaise Cake I've heard about over the years. I had to laugh at your comment about rumblings in the other room, now my 8 month old is on the move that happens alot at my house too. I'm visiting from Centsational Girl's Link Party. I hope you'll stop by to say hi. Amanda this looks so so good! I know my husband would want me to make this!